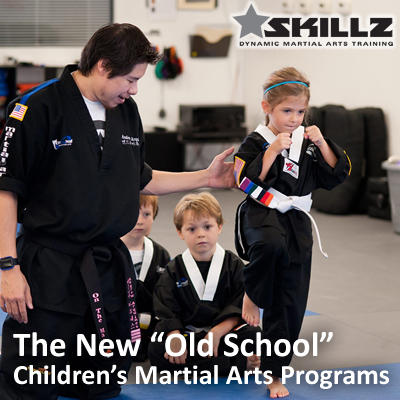 Being a Veteran Martial Artist who started training in 1987, I have witness many changes and innovations within the industry, including the progressive transition from all age classes to age-specific classes. What I have also discovered is that many schools are stuck in the middle. In this blog, I am going to share some important facts that may motivate some of those schools that are still stuck in the middle to make the transition into the next generation of children’s Martial Arts training. A decade ago, you were an innovative school if you provided a pre-school program for children ages 3 to 6, and then a juniors program ages 7 to 12. Today, you are an innovative school if you made the transition into breaking down your age groups even more to target your students’ stages of development. These age groups include 3 and 4-year olds; 5 and 6-year olds; 7 to 9-year olds; and 10 to 14-year olds. With that said, let’s break down some facts that compare the new “old school” children programs vs. “new school” children’s programs. If you combine these ages in one class, chances are you are experiencing high enrollments but low retention. You are losing the majority of your 3-year olds mainly because they are not “old enough.” You are also dealing with parents of 6-year olds that want their child to move into the juniors class because they think they are “too old” for the pre-school class. At the same time, the instructors in this class struggle every day to teach a meaningful, results-driven class. Think about it. You are teaching children that attend pre-k in the same class with kindergarten and 1st graders. If you understand early childhood education, then you know that this is a wide range of physical, intellectual, emotional, and social capabilities. It is no wonder that 3-year olds are quitting, because most new pre-k students cannot write their name. At the same time, what parent of a 1st grader would want their child learning side-by-side with a preschooler? If you split up your age groups according to these ages, then you are experiencing decent enrollments and high retention. You may be losing some leads because some siblings fall into both categories and the split classes are inconvenient for parents. However, since you are targeting each age groups stage of development, your classes are measureable and results-driven, therefore retention and referral rates are much higher. Think about it. Your 3 and 4-year old classes are focusing on early childhood fundamentals, which means that even the youngest 3-year olds are showing progressive growth and development. At the same time your 5 and 6-year olds are working on basic fundamentals, which means that the 6-year olds feel challenged and do not have the desire to train with the older kids just yet. Both classes are just right and this means great retention; happy staff; and happy parents, which also means more qualified referrals! There is an obvious benefit to the ‘new school’ preschool concept. However, it is understandable that many schools are hesitant to make that leap either because they do not have room in their schedule, or, they are afraid of losing students and new leads because it is more inconvenient for those that have children whom fall into both age brackets. If that’s the case, then you have to make a calculated forecast of how many new students you can attain -and retain- if you made the leap. In next week’s blog, I will break down comparisons between the new ‘old school’ junior’s programs vs. the ‘new school’ junior’s programs. Email me at melody@shumanconcepts.com to receive a FREE copy of Early and Basic drills that target each age group. Seeing drills side-by-by that compare each age group can help instructors see the significant learning curve between them. thank you for the wisdom!! !